… as they are not so smart, but rather dangerous !! 'Smart' Meters, as they are already in use in various countries overseas, are not so SMART at all, as they may be causing SERIOUS HEALTH ISSUES, due to uncontrolled (HF/RF) radiation from them. It is only a matter of time . . .
TOXINS, never mind how pretty wrapped up still stay POISONOUS! When Technology threatens YOUR HEALTH and WELL-BEING, it should not be implemented, or only with utmost caution, after seeing long-time tests & effects, and not like the Cellphone Technology was implemented all round the globe. We urgently need MORE GREEN TECHNOLOGY, which works FREE of such RADIATION !!! It is NOT FAIR and ETHICAL to even THINK of installing technology, in South Africa (or anywhere else), that is not safe and could be causing various SERIOUS HEALTH ISSUES overseas and is already being REMOVED there again - after several Court Cases have been won against the Power Companies !! We are already having more than enough HEALTH IMPLICATIONS with problems from Cellphones and Wireless-LAN technologies, as is. - Who signs liable for DAMAGES to your HEALTH ??? Also see NetMetering for more information about that. Is the GOVERNMENT introducing Electronic Microwave Warfare into YOUR HOME ??? — Control right into your OWN HOME? HOW CAN YOU BE SO STUPID/ and install similar //Smart Meter Technology which has already caused severe ILLNESSES at other places overseas and needed to be removed? What do other researchers say? Get your 'Smart' Meter ACTION PACK !!! Finally!!! CLASS ACTION OF ELECTROSENSITIVE from "SMART" METERS! — Well done!! Smart Meters CAN BE HACKED !! Big Brother is watching your Electricity Consumption online and 24/365 !! Smart metering being rolled out in SA — More like "Forced down your THROAT !! Smart Meters are supposed to replace ordinary meters for electricity, water, gas and other items to be measured regularly. They are working over the existing power line, transmitting their corresponding reading by superimposing (coded) high frequency electrical impulses onto the power line transferring it to a logging station on the supplier's side. — The workings if this is very similar to Ethernet over Power Line also called 'Homeplug Powerline' (50 - 200 Mbps), this is also something we would not recommend. — Then there are also the WIRELESS Versions transmitting everything via a WIRELESS NETWORK (RF), some meters transmit there readings every 15 minutes!! By superimposing a high frequency (HF) signal to reach the supply organisation (like the City Council) one would not only need quite a high signal level, but the strange thing is the transferred signal cannot really be directed into a specific direction - directly to the service provider collecting these readings, so it will also reach the internal wiring of your whole house and that of all your neighbours in the area, too. Likewise if your neighbours' readings are transferred these will also reach your home's internal wiring. So far not so bad, but over the time these 'Smart Meters' have now been implemented numerous people had serious HEALTH PROBLEMS, due to these superimposed HF frequencies and the radiation it causes. Even various doctors have made their voices heard as their patients health is greatly affected - with all kinds of problems, commonly known (and still unknown) which are linked to Electro Smog1 and instructed people to return their 'Smart Meters' and have them replaced with the old analogue ones again. However this procedure is not as easy, mostly resulting in a court case with the suppliers. So, please be careful and don't install such a 'Smart Meter' from the start and make sure that your neighbour does not install one either, as this will also interfere with your health - and will only be a matter of time to see and feel the actual problems. Please sign up and make use of our FORUM, to discuss these problems, or directly join the EHS Forum, or on Facebook, and exchange information with people who are already experiencing these problems and those who have effectively gotten rid of such devices. — Please don't be ignorant, after all its YOUR HEALTH that is on the line here. 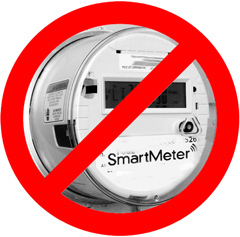 We are ONE -- Smart Meters - Just say "No!" SafeSmartMeters - Yes, there are SAFE options, too !! Health Concerns grow: Consumers are getting sick from wireless "Smart-meters"
More and more people are discovering that otherwise unexplained health problems can be correlated and attributed to electromagnetic exposures from wireless devices, especially the new generation of "Smart Grid" digital electric meters. Because of the wireless industry's irresponsibility and wrongdoing, unfortunately, legal actions have become necessary. There are many illnesses and injuries caused by digital electric metering. Liz Barris, a lawsuit organizer, announces in this video how to recognize the symptoms of EMR exposure and how to contact competent legal assistance to join existing and upcoming legal actions to protect you and your family's health, safety, privacy, rights and property. Get these things off yours and your neighbours home as fast as you can! Fight against smart meters in any way you can!! If they have made you ill, join our lawsuit or start your own! If you don;t like your 4th Amendment right to privacy violated, get it off your house! If you don't want to be over billed for the rest of your life, go solar and do NOT let them put a wireless meter on your home! - Disconnect from the grid! Farren Lander M.A. Presents: the real truth about the health hazards of Smart Meters which they forgot to tell you. Part-1 of a 90 minute presentation. Become informed, not brainwashed ! For updates and things you can do to assist in spreading the word & protecting both your & your children's health. Young people are the most in danger from practically all wireless devices. Great message in a musical composition, written specifically for the KeepEmStraight Channel. Watch section starting at 52:52 to hear this tune in context with the subject. In this invitational presentation to the San Francisco Tesla Society consulting engineer Rob States explains how PG&E's so-called 'smart' meters work and why they endanger health and privacy. He asks the obvious question, "Why would you trust the company that brought you Prop. 16?" ARE PG&E SMARTMETERS REALLY SMART? The city councils of Santa Cruz, Scotts Valley, Capitola and Watsonville, and the Santa Cruz County Board of Supervisors have called for a moratorium on the installation of PG&E "SmartMeters". Why is PG&E ignoring these explicit demands and going ahead with the 2+ billion dollar "roll out"? The SmartMeter system collects electric and gas usage from homes and transmits the data via pulsed microwave to a wireless network (=no meter readers!). FIND OUT if these microwave meters are the future for GREEN energy or DANGEROUS and INACCURATE and reveal private details of daily life - when people wake up, come home, take a hot bath and go on vacation. Smart Meters can either work for you—or against you. Tens of millions of smart meters are being installed globally. In California alone 13 million homeowners will have a smart meter by the end of 2012. It will monitor your energy use, tying you into a smart grid world. If you have a monthly electric bill of $100 or more you need to know about smart meters, and how to make sure they don't hurt you. Specifically, how they can negatively impact your bank account, your lifestyle and your privacy. You have the opportunity to make the "smart meter" reality help you. With solar, you can make the smart meter work for you—-instead of against you. The smart meter can provide you with energy information. By adding solar, you can turn this information to your benefit. You can save energy and money. You can ensure your family's privacy and security. Come to the Smart Meters and Solar neighborhood meetup in your town to get all your questions answered, check out your energy options and see how much money you can truly save. In this talk, I will demonstrate that the concepts and techniques pioneered by the Internet, the fruit of four decades of research in this area, are directly applicable to the design of a smart, green grid. This is because both the Internet and the electrical grid are designed to meet fundamental needs, for information and for energy, respectively, by connecting geographically dispersed suppliers with geographically dispersed consumers. Keeping this and other similarities (and fundamental differences, as well) in mind, I propose several specific areas where Internet concepts and technologies can contribute to the development of a smart, green grid. I hope that our work will initiate a dialogue between these two communities. S. Keshav is a Professor and Canada Research Chair in Tetherless Computing at the School of Computer Science, University of Waterloo, Canada and the Editor of ACM SIGCOMM Computer Communication Review. Earlier in his career he was a researcher at Bell Labs and an Associate Professor at Cornell. He is the author of a widely used graduate textbook on computer networking. He has been awarded the Director's Gold Medal at IIT Delhi, the Sakrison Prize at UC Berkeley, the Alfred P. Sloan Fellowship, a Best Student Paper award at ACM SIGCOMM, a Best Paper award at ACM MOBICOM, and two Test-of-Time awards from ACM SIGCOMM. He is a co-founder of three startups: Ensim Corporation, GreenBorder Technologies, and Astilbe Networks. His current interests are in the use of tetherless computing for rural development, and for gaining efficiency in energy generation, transmission, and consumption. Keshav received a B.Tech from the Indian Institute of Delhi in 1986 and a Ph.D. from the University of California, Berkeley, in 1991, both in Computer Science. 1. Footnote still to be added HERE.